After a bit of insight into the Port Arthur Paranormal Investigation Experience? Head on over and check out this great review by Rob McFarland. After coming along for a PIE night, eager participant Gary wrote a lovely review of his evening. We wanted to share his thoughts on the experience with you. It’s also interesting to note that the lights in the Commandant’s study were noticeably swinging again. This is not a first time occurrence, and we’ve worked out that the motion of someone coming into or out of the room triggers the light to swing. I had thought this would help debunk the experience I had with a group in there in 2013, however Cait pointed out that if the light swings because of movement, someone had to have triggered it in the first place… the mind boggles! And it was with this attitude that I decided to join up for the Port Arthur ‘Paranormal Investigation Experience’ (PIE) for what I hoped would be an enjoyable, interesting and possibly life changing experience. 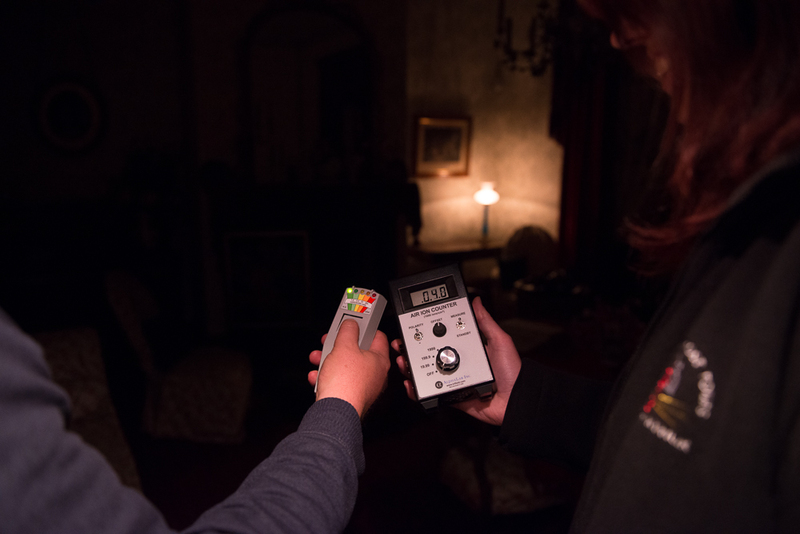 According to the brochure the PIE “allows visitors to conduct their own paranormal investigations with the assistance of the latest ghost hunting equipment throughout some of the most haunted buildings at the Port Arthur Historic Site”. How could anyone with an interest or even a mild curiosity in the paranormal pass up on a chance like that? I know I couldn’t. I arrived at the Port Arthur visitors centre at a quarter to ten and met up with my fellow enthusiasts, six in number and two guides John and Mel. John is a confirmed believer and makes no secret of this; his beliefs are based on any number of personal experiences that have occurred whilst conducting Ghost Tours and PIE’s at the Port Arthur site. Mel is a bit more sceptical in outlook, although she has had several personal experiences she is yet to experience that one life changing event that will make her an ardent adherent to the cause. John’s enthusiasm was contagious and could have easily influenced ones mind, Mel’s guarded scepticism was just enough to keep the whole experience in perspective, together they made a damn fine team. So our team of seven investigators and two guides formed a very close knit bunch, they will do groups of up to twenty but I felt the smaller numbers were ideal. After getting sorted and providing flashlights we got started, we walked with John whilst Mel went on ahead to the Asylum to set up a short audio/visual presentation (and a refreshment table that was most appreciated). The night was warm and humid, a slight breeze blew in some light brief showers from the NW, just shy of the visitor centre we stopped under the shelter of an overhang where John gave us a quick brief on the night’s events that were to follow, I will be perfectly honest, I was hanging on every word. We moved on a short distance before John once again halted us in the relative dryness of the old church where he regaled us with tales of the elusive ‘hat man’. I replied “depends, what did you see”? And he went on to describe to a tee what I had seen and agreed the light came from within the building. John confirmed that no one was in the building. A good start to the evening. We continued on to the Asylum for a very welcome coffee and Mel’s presentation on what we were looking for and the equipment available to us. Suitably briefed and equipped we then took a walk to the Commandants residence where we were to conduct a group ‘EVP’ session before branching off on our own and conducting individual sessions. During the group EVP session I think I heard a distant muffled response to one of the inquiries but time will tell, when you’re sitting in a 175 yr old house (erected 1833) in the middle of the night seeking out the paranormal one’s imagination is running amok who knows what is real and what is imagined? In the Commandants study I noticed the large central light fitting was swinging when I entered, so I physically brought it to a halt. It was stationary when I walked out, when two of the group entered a short time later it was once again swinging, I put this down to the fact that there is nary a straight line in the house, you have the original building then the subsequent add ons that appear to have been achieved by rule of eye only. At the rear of the house was a bedroom that once belonged to a Mrs Marie Brimmage who ran the house as a hotel in the 1920s. Above her room is a small loft where her daughter Dorothy used to sleep. I conducted an eight minute EVP session in this room and attempted to make some contact with Mrs Brimmage. I experienced a strange sound x 3 (almost like someone snapping their fingers somewhere in the room) that I couldn’t explain nor replicate. I was alone in the room in pitch darkness and sitting in the fireplace talking to someone/something that I do not know if they exist, a strange experience on its own. I bade Mrs Brimmage and Dorothy farewell and we departed the Commandants house for the Separate Prison and I will have to be 100% honest here, NOT my favourite place on the site. I find the segregated chapel within the prison extremely eerie and an uncomfortable place to be, and that is in the day time, at half past bloody midnight the feeling was ten times worse. Once again we conducted a group EVP session before going our separate ways to conduct individual EVP’s. As I had previously voiced my feelings and opinions on the segregated chapel it was unanimously agreed that I should take that area. . . .Thanks Guys/Girls. Well I entered, once again pitch blackness, closed the door behind me, stomped my way to the pulpit, mounted it and attempted to provoke a response. I called upon any “Convict Scum” present to state their name and the “Crime for which they had been sentenced”, I told these “Low Lifes” that the Commandant had granted them permission to speak and that they are to do so NOW. I cut loose, did I get a response? I don’t know but hopefully the DVR I was carrying may have picked up something. Truth is I was glad to get out of that place. I Don’t Like It! After visiting the Separate Prison we returned to the Asylum for a very well deserved and welcome supper, after a brief sojourn to recharge it was time to start again, this time we were off to the Senior Medical Officers Residence in particular a rather interesting subterranean chamber known simply as the “Dissecting Room”. John led us into this chamber and explained that although there was no documented evidence that was the purpose of the chamber we were to make up our own minds. This room was approx 5 x 3m maybe slightly larger with a low ceiling, the prominent feature was a stone table centrally placed, there were also some substantial metal spikes driven into the end wall although I don’t know if these are a feature of the original building or later additions. I have attended a couple of autopsies in the past and the similarity of this room to what I have seen previously was uncanny, I have no doubt what this purpose built room was used for, the only difference between it and a modern facility are the materials used and the lack of running water/electricity. In an adjacent cellar is a curious feature of a stone chute protruding from the wall, the other end of this chute is adjacent to a fireplace above, and once again anecdotal evidence suggest this may have been used to provide ashes to the basement based on their absorbent qualities and the quantities of blood and body fluids that may have accumulated down there. Departing the “Dissecting Room” and it was on to the place I had been looking forward to all night, The Parsonage. Events and experiences that have occurred at the Parsonage have been well documented. Just about everything that could happen in a paranormal fashion had been witnessed and documented from within these walls. In one room within the house EMF readings are “off the scale”, not paranormal but could easily be responsible for individuals to feel uneasy or nauseous in that area. I would have liked to have explored the upstairs of the house as from all reports that I have read that is where the majority of experiences have occurred, alas this was not to be so, the upstairs area is locked due to Health and Safety reasons (the wooden staircase is at too great an angle (60 degrees) to permit access. After exploring the house individuals scattered to conduct their own EVP and or full spectrum photographic sessions. I chose to go outside, I had heard stories of full body apparitions and shadow people being viewed external to the building. I turned on my DVR and started on the front veranda; I was talking to unseen entities and taking photographs front back and sides. At one point at the rear of the building I GOT SCARED. This was not the feeling of unease or nerves that I felt at the chapel in the “Separate Chapel”. This was fear, goose bumps, neck hair on end, shallow breaths the works my body was in the classic ‘fight or flight mode’; I chose the latter and beat a hasty retreat back around the side of the building where I immediately felt better. I saw nothing, I heard nothing there was nothing there to elicit this response, I know that now, I knew it then and indeed was telling myself out loud exactly that, but it was a real feeling of fear and dread, maybe brought about by the darkness, shadows and paranormal expectations, I don’t know. I did not mention this to anyone on the night but stood shaking on the veranda for a few moments letting my heart rate slow down a bit, I checked my DVR only to find that it was not switched on, I swear I started recording before I started exploring outside, maybe not. Time was getting on by this stage and it was almost time to call it a night but the Parsonage had one more little trick up its sleeve for us before we left. As we had been explained to at the start of the investigation that manifestations take many forms and can impact on any of the five senses (sight, touch, hearing, taste (on rare occasions and smell) plus emotions. It was the last sense that we were assailed with on leaving the Parsonage noting that we had stood by or passed through the gate to the property twice on the night, and been greeted by the slightly sweet scent of the garden blooms. This time the scent that greeted us was totally different, it was the stench of decomposing or rotting flesh and it was at its strongest at the portal to the property, the smell was localised at the gate, it was being carried on the breeze but dissipated just a few metres from the gate. I looked around I could not locate any rotting carcass of any kind even checking under the vehicle, not that the decomposition process of a dead animal would reach that fetid a stage in the twenty minutes or so we were in the Parsonage. The smell was real, where it came from is not known, no one left the group to collect and/or dump rotten roadkill and if they did they hid it well, to me the smell was coming out of thin air at the gate. So there you have it, my account of my ‘PIE’ and in the words of Oliver Twist. . .
We’ve been A.W.O.L for a while, it’s so mysteriously that it’s almost spooky…! The reality is we’ve had a busy time of it lately, with not just our regularly scheduled Investigations, but also an evening spent with Nick and Woody from SEA FM Hobart, and their 4 lucky competition winners, and a private investigation for a group from New Zealand. Cait’s currently working on an update from the last few investigations, we’ll get it posted up soon as we can. Things are going well for the Paranormal Team here at Port Arthur, and the Investigations are getting more and more popular, so if you’re planning on coming to join us any time in the next few months I recommend getting your booking in soon. Last night’s PIE was booked out several weeks in advance! Having talked to Cait about last night, she reports that whilst her group were at the Asylum she could hear loud dragging and banging noises inside the Separate Prison. She said it was as though heavy metal objects were being dragged along the corridor in the prison. She assumed it was John’s group still inside investigating, but when the noises became even louder and she went to see what was going on she found the building was locked up tight with no one inside. We also need to give a huge shout out and thank you to Casie Lee, who has joined us here for two investigations, and has since been an absolute trooper helping out with the data analysis. Thanks so much Casie, we sat down and had a good look through everything you sent us before the PIE last night and it looks like you’ve picked up on some brilliant anomalies, we particularly like the voice in the Commandant’s House that appears to say “Tell them to go away” and “Dont go in to the bad room”. We’ll post some up as soon as we’ve had another look at them. Any wayward data discs are soon to be on their way to their new homes, my project for today is to get through the backlog so keep an eye out for your incoming discs soon. A very common response we seem to be getting from people who join us for P.I.E. nights is a reaction of nerves; not just towards the Historic Site, but also towards the gear we use! It’s all high tech and fancy and can look pretty intimidating to someone who’s never had the chance to play with it all before, but for the most part it’s all pretty straight forward and certainly nothing to be scared of. We use so much gear because we want to track as many variables as possible during an investigation. Because no one can define exactly what paranormal activity is, we need to cover as much ground as we possibly can, including some things that we as human beings can’t detect without gear to show us. What does some of the equipment look for? Fluctuations in atmospheric conditions such as temperature, humidity and air pressure. Fluctuations in positive air ions. So basically all of the equipment you get to use is not necessarily designed to prove the presence of the paranormal (with the exception of video cameras/sound recorders), so much as it is designed to rule out external influences which might contribute to paranormal experiences. So what does this all mean for investigating? If you’re wandering through an old house with an EMF meter and it lights up, chances are you’ve stumbled across a field produced by faulty wiring or a security system. If it’s in a location where people are prone to experiencing odd sensations, there could be a correlation between the EMF and the effect it has on humans. It makes you wonder about places like the Parsonage and the Commandant’s House, where we have long documented histories about people experiencing the paranormal, and have since discovered substantial EMF leaks from the respective security systems in the buildings. Is there a link there? Or are people truly experiencing ghostly apparitions and the like? Likewise, a sudden drop in temperature doesn’t mean you just walked through Casper, but might be linked to pockets of air in the building. Or you might feel a sudden drop in ambient temperature, but a thermometer might show that nothing’s happened. This is why so much flashy gear! A few weeks back we had a private Investigation for some visiting journalists. It was a great night, sadly no spooks but everyone was edgy enough without anything dramatic happening. The appearance of a wee ghostie may have tipped everyone over the edge! It got us thinking about familiarity and the difference it makes to fear levels. Sometimes it’s hard for those of us who’ve been around Port Arthur a while to remember that when you’re new to the place these ruins and buildings can be very much on the creepy side. For us it’s the place we spend hours in every week. It is familiar, and comfortable (some of the time), and it’s only when the anomalous events kick it up a notch that most of us experience fear. For visitors, this is a very big, unfamiliar and rather terrifying ex-prison full of dark and somber ruins, and potentially spooky things that want to come and say hello (we hope!). Earlier that same week we spent many hours freezing our behinds off at the photo shoot for our brand new promotional images. Keep an eye out in the coming weeks for the glossy and glamorous pics of the P.I.E. A big thanks has to go to all of the volunteers who turned up to model for us, both the locals and our team of Volunteer Archaeologists who’ve been working on the Penitentiary project in the last few months. Thanks for helping, you guys were troopers! The April Investigation took place on Saturday the 27th, and a highly successful investigation it was too (To quote Caitlin it was “Ridiculously fun”). About the strangest thing that happened was during the Separate Prison investigation. Caitlin heard voices outside the prison towards the end of the investigation and thought that Jenni’s group had arrived to switch locations. So Caitlin packed up her group and moved outside to let Jenni’s group in only to find that they were halfway across the site still, and only just starting to make their way towards the prison. No one was loitering near the prison at all. Cait claims that the Site is now messing with her for her scepticism, and I really hope that’s the case, it could surely get pretty interesting in the next few months! The same noises were heard later in the night when one of Caitlin’s group decided to forgo the last Investigation and wait in the Lunatic Asylum alone. She too heard the noises by the Separate Prison, though she was the only person in the area at the time. I just love the fact that the person hanging out in a 19th Century Lunatic Asylum started hearing things, it’s a bit twisted really. We also welcomed back the Enright group from Deloraine who have now been on the Investigations with us 3 times. They had a great night with Jenni, and since finding a passion for the Paranormal have even gone out and bought themselves some gear which they brought along and let us have a look at. This group can commonly be found checking out cemeteries and haunted hotels around Northern Tas. Nice work guys! The May Investigation is on Saturday the 25th, to join us please click here to head over to our bookings site. If you have any questions you would like to ask any of the Paranormal Team, please leave us a comment below, or send us an email to paranormal@portarthur.org.au. And don’t forget to follow this blog by email to keep up to date with all of the latest anomalous events on site!